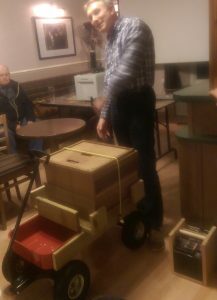 October SBKA Meeting: A Paleontologist’s Perspective on the Evolutionary History of Bees with Dr John Varker. Dr. W. John Varker is a retired Leeds University Palaeontologist (Earth Sciences Department) with experience in Adult Education. His research concerned microfossils used for dating rocks which is obtained by dissolving limestones. For five years he was a member of an International Committee visiting sites in Germany, France, Ukraine, China, Mongolia and several parts of the United States. John came to beekeeping only recently when he inherited a single empty hive and joined the Leeds BKA. 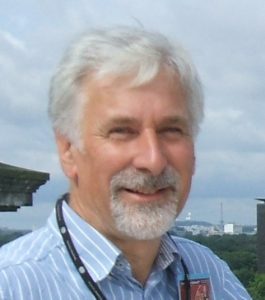 Our Speaker for September was David Aston on the subject of ‘Integrated bee health management’. 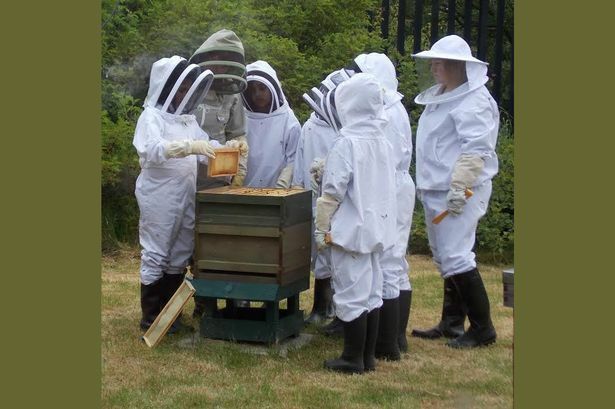 David is a Master Beekeeper, a Past President of the BBKA and has been the Chair of the BBKA Examination Board. 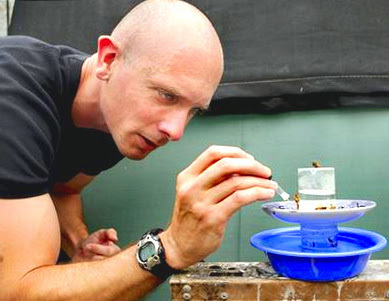 Dr. Andrew Barron, originally from Lincolnshire, studied zoology at the University of Cambridge, where he gained his doctorate, and has since worked at universities in the USA and Australia, having worked at Macquarie University in Sydney for almost 10 years where he is currently Associate Professor in the Department of Biological Sciences. His current interests are split between studying the neurological systems of bees and ants including developing mathematical models of honeybee brains, and also, in response to the recent colony collapse phenomenon, he is now studying how to improve the resilience of honeybees to the likely causative factors. Having already given a lecture at Sheffield University recently on the first topic, he came to the SBKA meeting on 11th July to talk on matters arising from the second. In spite of the clash with the screening of the football match between England and Croatia a surprisingly large number of members attended. Australia is one of the very few places not as yet invaded by the varroa mite, this has enabled a study there of the effects of thymol, currently used as a treatment against varroa, on the honeybees themselves (and not efficacy against the mites). Those exposed to the treatment as larvae were neurologically damaged and never performed well afterwards. There was an effect on the hygiene behaviour of house bees, and the uncapping and removal of faulty larvae increased by some 40%. Unfortunately however, the activity was then less discriminatory, with healthy larvae becoming involved as well as unhealthy. Perhaps this is not surprising as both bees and mites are arthropods having similar neurological features. Although not yet tested, it is thought that probably all other known chemical treatments, such as oxalic acid, formic acid and amitraz, may prove to have similar deleterious effects on bees. Factors affecting the performance of foraging bees were then raised. Very sophisticated technical experiments had been carried out involving the identification of foragers, weighing them and timing them on leaving and returning to their hives. The investigators became frustrated that they were unable to measure the pollen loads of returning bees as they were lighter on return than when they had left. This was because the bees loaded up with heavier nectar before leaving to fuel their forthcoming flights and returning empty. The investigation revealed that it is most important that the worker bees are able to go unstressed through the whole normal development process before becoming foraging bees. Stressed colonies where foragers die prematurely forces younger bees to forage too early. They are then inefficient, may only do a handful of trips and then die or get lost, whereas ‘normal’ experienced foragers are very efficient and may do a hundred or more trips before they die. 20% of them do 50% of the work. However, anything that stimulates an immune response in the foragers (and they are very sensitive) will curtail collection of pollen. With regard to the other topic of research interest, it was mentioned that a variety of ideas to help beekeepers overcome their more recently arisen problems are currently under active investigation and consideration for practical application. 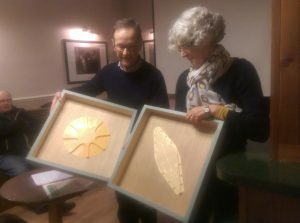 Our April speaker was Derrie O’Sullivan who gave us some interesting alternative views on working with your bees. Derrie is the Chairman of Huddersfield Beekeepers Association. He shared a wealth of experience on his philosophy of ‘hands off’ beekeeping. Graham Royle spoke at our March club meeting on the ins and out of swarming. Graham is a celebrated national speaker from Cheshire and is very involved with the education of beekeepers at all levels. He has been keeping bees for over 25 years and holds both the BBKA Master Beekeeper qualification and the National Diploma in Beekeeping. Graham is an excellent speaker and this timely talk on swarming provided many incites to this miraculous and occasionally troublesome aspect of the bees life cycle. We were very fortunate to have our Regional Bee Inspector, Ivor Flatman, who spoke about bee health. He gave us an update on the invasive Asian Hornets, how we can help to spot them, and what action the National Bee Unit is taking to confront this threat to our bees. In view of the recent outbreak of European Foul Brood in the area, he also advised us how to mitigate the impact of this disease and for what signs we should look out. Our January meeting was our DIY special. Members brought in their creations great and small. We saw creative ideas and beautiful workmanship as we we were treated to a variety of creations including an incubator, honey warming box, vaporisers, clearing boards, a beautiful nuc, equipment transporter and solar wax melter. We even had a demonstrion of a vacuum swarm collector. 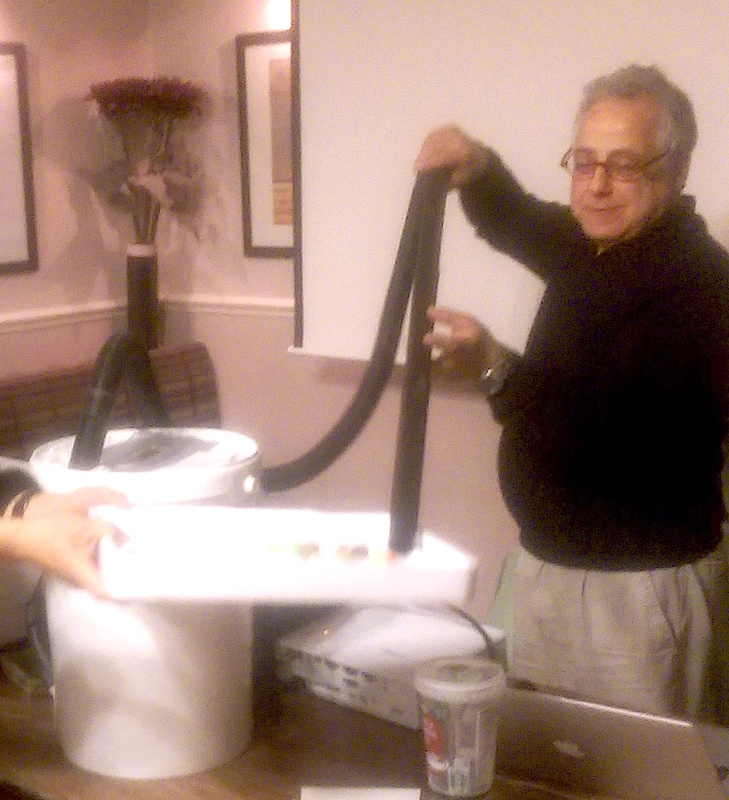 We also had a demonstration and a video of how to make your own hornet trap. Our November speaker was John Vendy. He is an experienced maker and user of Top Bar hives and a proponent of ‘natural beekeeping’. 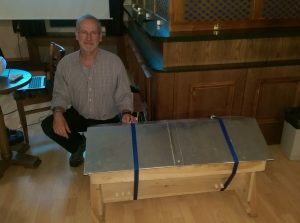 John spoke about the workings of a top bar hive and how they can easily and cheaply be made from a variety of reclaimed materials and what standards are usual in their construction. He even brought along one of his hives for us to look at. He outlined the use of the top bar hive and how the frames are manipulated. He included some tips on finding the queen that are handy for all beekeepers. His explanation of his own ‘natural beekeeping’ practice and the thinking behind this philosophy of beekeeping was illuminating. The evening allowed us to better understand beekeepers who follow this method of beekeeping and gave us all food for thought. Our October speaker was Yvonne Kilvington on “Setting up beekeeping in Schools” and what an inspiring talk we were presented with. 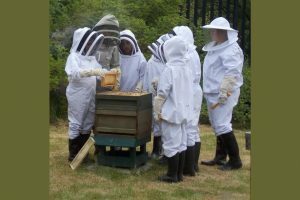 Children learning about growing vegetables, pollination and beekeeping, with an immaculate apiary and well-managed hives. Extracting & jarring honey, making candles and wax mouldings, honey sweets. Food hygiene, trading standards, enterprise all came into the programme. Looking at bees under a microscope! Wow! We learnt about risk assessments, health & safety, parents’ consent forms and students’ rules drawn up jointly with the students themselves. But most of all we learnt about the positive effect on the students’ learning & behaviour – confidence building, improved concentration, improved communications, better performance in the classroom. 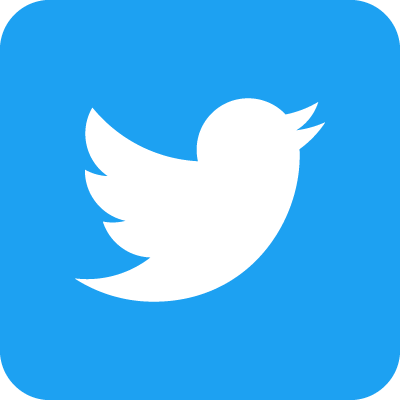 Why don’t all schools do this…. Not just interesting but informative and thoroughly enjoyable. We had an enthralling talk to start off our winter programme by Master Beekeeper Pete Sutcliffe with “The hive as a processing centre”. With their origins going back 6o million years, we learnt that bees have not evolved for the last 20 million years or so. Pete painted a fascinating insight into the world of the honeybee hive and what goes on. Not just honey, but wax, pollen, propolis & water are collected or processed by the colony – a “super organism”. Those of you who didn’t make it missed a treat! Sheffield Fayre and SBKA Honey Show. Bank Holiday Monday 28 August.